We get asked this question a lot. The answer is complex. Topsoil is the upper 2-8 inch layer of soil. It is a mixture of organic material and minerals. This is the layer of soil where most of the nutrients for plants are found. Organic simply means without the use of pesticides, synthetic fertilizers, sewage, genetically modified ingredients or ionized radiation. Certified Organic means no pesticides, etc. have been applied for 3 years. So topsoil by nature is organic. But it may or may not be pesticide free, if pesticides have been applied. 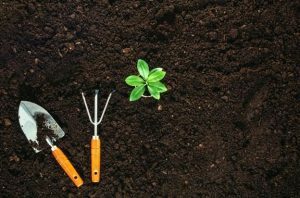 If you are looking for pesticide free topsoil you need to find a supplier that knows if pesticides have been applied and has the certificate to proof it. That can be very difficult and expensive. Most topsoil is stripped from farm fields and most likely has had pesticides applied to it. It is a myth to believe that topsoil has to be very black to be good. The black portion of the soil is the organic material that is decomposing. If it is too black there may be too much organic material and that would be considered compost. The other portion of the soil is the minerals. So it may be good soil and not deep black. Also a myth is that good topsoil does not contain weed seeds. All topsoil contains weed seeds. There is no way to remove them. If you heat the soil up it will kill the weed seeds but it will also kill all the valuable microorganisms in the soil. Generally it is a good idea to mix the new topsoil with your existing soil. This will create a natural way for water to drain and moisture to percolate up. It takes Mother Nature 500 years to produce 1” of topsoil. We believe that makes topsoil worth it’s weight in gold.